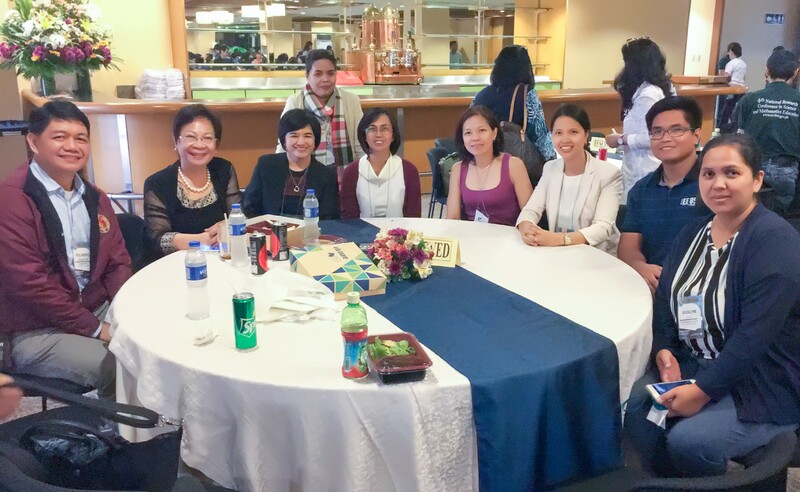 Twelve UP Open University students under the PhD in Education program of the Faculty of Education (FEd), together with their Dean, Dr. Ricardo Bagarinao, and some dissertation advisers participated in the 4th National Research Conference in Science and Mathematics Education held on 27-28 February 2018 at the Philippine International Convention Center, Pasay City. The PhD students are scholars of the Department of Science and Technology-Science Education Institute (DOST-SEI). The PhD in Education students with (from left) Dr. Ricardo T. Bagarinao, Dean of FEd; Dr. Josette T. Biyo, Director of DOST-SEI; and Dr. Maria Ana T. Quimbo, Affiliate Faculty Member of FEd and one of the dissertation advisers of the students. Dr. Bagarinao said that the conference, with the theme “Innovations in Science and Mathematics Education for Inclusive Development”, served as a venue for the current DOST-SEI scholars and former scholars to meet and share their research works that may have potential contribution to national development.